James was delivered from this life of shadows. Regarding the life of Saint James, we have incomplete information. Neither the place of his birth nor the place where James served as Bishop are known. We known that from the time of his youth he was inclined toward the ascetic life, and he purified himself through fasting and prayer. Due to his great virtue he was elected Bishop. On behalf of his veneration of the holy icons, the blessed one endured many trials and exiles at the hands of the iconoclasts. Having endured these trials bravely, including hunger and thirst, he delivered his soul into the hands of God, and from Him received the unfading crown of confession. Some sources indicate that he was persecuted during the reign of Constantine Copronymos (741-775), while others believe he was a monk at Stoudios Monastery and a disciple of Saint Theodore the Studite (759-826) before becoming a Bishop. 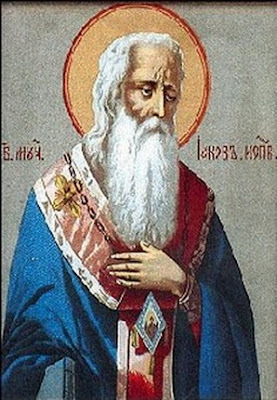 It is further believed this may be the James to which Saint Theodore the Studite dedicated a homily (PG 99, 1353-1356) and says that he died as a Confessor in 818, though he does not refer to him as a Bishop. Shining forth in holy abstinence, as a Hierarch and Minister of God the Word, thou didst rightly divide the inspired word of truth. By thy virtuous struggle thou dost confirm and reveal the grace given to thee, and teach all to worship the Saviour's icon, and thou dost pray to Him for us all. Thou didst excel in the gifts of the priesthood, and by thy struggles didst become illustrious in confessing the Faith. Since thou art a fruitful branch of Christ the True Vine, grant the new wine of forgiveness and salvation to those who cry: Rejoice, O Father James. A living and reasonable image, you showed yourself to be, who passed your life in virtue, as a champion and preacher, you were seen to honor the icons, in the Holy Spirit O James.